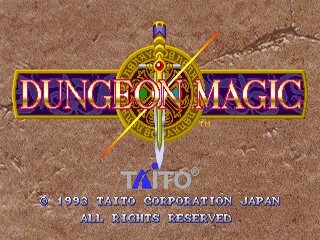 Released in 1994, Dungeon Magic is another great game from Taito. An evil magician kidnaps a princess in order to bring back an evil spirit. It is up to four heroes: a knight, a martial artist, an elven archer and a wizard, to save the day. Unlike most beat 'em ups the game offers isometric angle and unusually large sprites. Best time: Single-segment 0:17:19 by Tim 'iast' Treichel on 2014-08-04. Taito's 1993 dungeon-crawler/brawler mashup is a curious beast to say the least. It kinda circumvents the brawler formula of "do not pass go until every entity in the vicinity is a bloody pulp" in places and instead goes for "do not pass go until this priceless artifact is rubble". That and the somewhat open way some of the levels are structured makes for an interesting run. In this run I roll with Gren mainly for two reasons; his charge attack for hitting low-lying enemies, and his 3-hit infinite. Not only is it his best damage-dealer but it's absolutely crucial for locking down enemies that have their AI set to counterattack out of hitstun. Also of note is that this run was done on the PS2 version of Taito Legends 2. While it is serviceable enough to do this run it also adds some unfortunate slowdown in quite a few places. Stage 1: Overall solid, no real complaints to address. Trickiest bits are nailing the jumps in the conveyor belt room prior to the miniboss and keeping the knights in the room after locked down. On occasion they like to deviate their movements and approach from more dangerous angles. Stage 1 miniboss (Giant Snake): A very agreeable fight. Snake either likes to be lunge-happy or just wanders about in circular patterns. The lunges are the more favorable of those behaviors since it's easier to direct where I want him to go and doing so lets me land more consistent strikes. Stage 1 boss (Dark Knight): Basically went as planned, though I'm still not entirely sure what was up with that vertical knockdown. Mainly I want Dark Knight and his sword to be close to the same plane as possible on DK's knockdown, to minimize the travel time of the sword returning to him. Stage 2: Picking up Gren's ice weapon in stage 1 is a big help here against the lizard-type enemies, though I still call shenanigans on it doing jack-squat against the miniboss for obvious reasons. This stage was decent in the run but with slight improvements pending, such as being braver in stuffing the mimic chests. Important to note is the lizardman room prior to the boss. It's not necessarily a run-killer but there's lots of little ways that room can go wrong very fast. It's definitely an encounter I err on the side of caution more often than not. Stage 2 miniboss (King Viper): King Viper is an interesting encounter to say the least. Melee him and you get a face full of fire for your trouble. Apparently Gren's level 2 charge doesn't qualify as a melee attack because Viper is more than happy enough to take it, right up to the point he's at half health and then he goes off on the drop of a dime. In my runs I tended to get a lot of variance on damaging him so I'd call this encounter an "okay" one. I can see this fight being improvable with more insight to his damage boxes and behaviors off-screen. Stage 2 boss (Queen Spider): The lag is strong with this fight indeed. As long as I don't drop the spell input on nuking the baby spiders, this often goes well enough as was the case here. One thing that disappointed and still befuddles me is that sometimes the boss' knockdown flag just shuts itself off and you can infinite her all day. As I have yet to find anything discernible that triggers it, I'm tossing it up as a bug and moving on. Stage 3: A decent enough stage but also the roughest part of the run. In particular, the 2nd room with the shield orcs. Some unfortunate RNG with them blocking that also made me go brain-dead for a moment. Also the room with the 2nd crystal is slowdown central and I despise it with every fiber of my being. On the upside, no snakes! Stage 3 boss (Lesser Demon): More like "Prime Punching Bag of the Nine Hells". Everything went to the letter here except for that random jump of his right before his death animation. Apparently throwing a temper tantrum is more important than saving frames. Stage 4: The shortest stage in the game. Minor hiccup at the start with jumping through the fire pillar. The 2nd room with the dogs/skeletons combination gave me a lot of troubles in routing until I figured out that throwing the dogs into one another was just enough to finish them off. Stage 4 miniboss (Dark Knight): Even more so compared to the first fight, controlling his movements and where his gear gets knocked down to is paramount. This fight could have gone better (got tagged once by his sword returning and some reps on him weren't as complete), but it's not the worst fight either. Stage 4 boss (Demon Lord): This guy can be a jerk in so many ways, he just decided to be less of a jerk in this run. This fight basically equates to "go for infinites, hope he doesn't jump to waste time with knockdowns, or try to counter with blaze thrust too many times". I do bait him into blaze thrust on his wakeup since it's easier to approach him afterward rather than from further away. Bonus points for the frame-perfect hit out of his downward thrust attack! I just want to give a big thanks to everyone that watched, supported and/or goaded me on getting this done. My ultimate goal with this though is to get an actual arcade board & supergun so I can give this game the run it really deserves. Just for reference, there's a solid minute's difference, if not more so, in running this on the actual hardware thanks to the PS2 port's slowdown.